Humankind’s origins and the beginnings of cultural expression may be traced to Africa. Recent discoveries in the southern tip of Africa provide remarkable evidence of the earliest stirrings of human creativity. Ocher plaques with engraved designs, made some 70,000 years ago, represent some of humankind’s earliest attempts at visual expression. Although much remains to be learned about Africa’s ancient civilizations (refers to a relatively high level of cultural and technological development; the cultural characteristic of a particular time and place) through further archaeological research, such discoveries suggest tantalizing possibilities for rich insights into human as well as artistic evolution. Rock paintings depicting domesticated animals provide artistic evidence of the existence of agricultural communities that developed in both the Sahara region and southern Africa by around 7000 B.C.E. As the Sahara began to dry up, sometime before 3000 B.C.E., these farming communities moved away. In the north, this led to the emergence of art-producing civilizations based along the Nile, the world’s longest river. Egypt, one of the world’s earliest nation-states, was unified as a kingdom by 3100 B.C.E. Further south along the Nile, one of the earliest of the Nubian kingdoms was centered at Kerma in present-day Sudan and dominated trade networks linking central Africa to Egypt for almost one thousand years beginning around 2500 B.C.E. 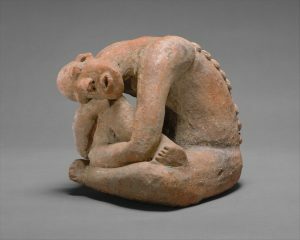 A corpus of sophisticated terracotta (a hard, fired but unglazed clay ranging in color from pink to purple-red but typically brownish red, used especially for sculpture and pottery) sculptures found over a broad geographic area in present-day Nigeria provides the earliest evidence of a settled community with ironworking technology south of the Sahara. The artistic creations of this culture are referred to as Nok, after the village where the first terracotta was discovered, and date to 500 B.C.E. to 200 C.E., a period of time coinciding with ancient Greek civilization. Although Nok terracottas continue to be unearthed, no organized excavations have been undertaken and little is known about the culture that produced these sculptures. Terracotta heads, buried around 500 C.E., have also been found in the eastern Transvaal region of South Africa. These important ancient artistic traditions are underrepresented in Western museums today, including the Metropolitan, due to restrictions regarding the export of archaeological materials. The first millennium C.E. witnessed the urbanization of a number of societies just south of the Sahara, in the broad stretch of savanna referred to as the western Sudan. The strategic location of the Inland Niger Delta, lying in a fertile region between the Bani and Niger rivers, contributed to its emergence as an economic and cultural force in the area. Excavations there at the site of Jenne- jeno (“Old Jenne,” also known as Djenne-jeno) suggest the presence of an urban center populated as early as 2,000 years ago. The city continued to thrive for many centuries, becoming an important crossroads of a trans-Saharan trading network. Terracotta figures and fragments unearthed in the region reveal the rich sculptural heritage of a sophisticated urban culture (see the Seated Figure, above). By the ninth century, trade across the Sahara had intensified, contributing to the rise of large state societies with diverse cultural traditions along trade routes in the western Sudan as well as introducing Islam into the region. Initially traversed by camel caravans beginning around the fifth century, established trans-Saharan trade routes ensured the lucrative exchange of gold mined in southern West Africa and salt from the Sahara, as well as other goods. Ghana, one of the earliest known kingdoms in this region, grew powerful by the eighth century through its monopoly over gold mines until its eventual demise in the twelfth century (see the Linguist Staff, left). The present-day nation of Ghana takes its name from this ancient empire, although there is no historical or geographic connection. In the early thirteenth century, the kingdom of Mali ascended under the leadership of Sundiata Keita, who is still revered as a culture hero in the Mande-speaking world. At its height, this Islamic empire, which flourished until the seventeenth century, encompassed an area larger than western Europe and established Africa’s first university in Timbuktu. 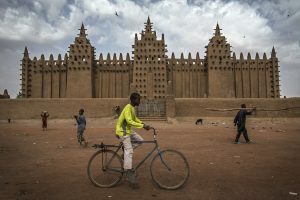 Under the Songhai empire of the fifteenth and sixteenth centuries, one of the largest in Africa, the cities of Timbuktu and Jenne (also known as Djenne) prospered as major centers of Islamic learning (image above). Beyond the kingdoms of the western Sudan, other centers of cultural and artistic activity emerged elsewhere in western Africa. 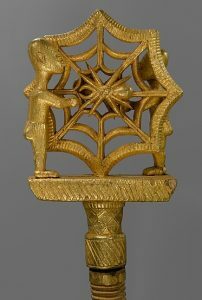 The art of metalworking flourished as early as the ninth century at a site called Igbo-Ukwu, in what is now southern Nigeria. Hundreds of intricate copper alloy castings discovered there provide artistic evidence of a sophisticated and technically accomplished culture. Nearby to the west, the ancient site of Ife, considered the cradle of Yoruba civilization, emerged as a major metropolis by the eleventh century. Artists working for the royal court in Ife produced a large and diverse corpus of masterful work, including magnificent bronze and terracotta sculptures renowned for their portrait-like naturalism (image left). 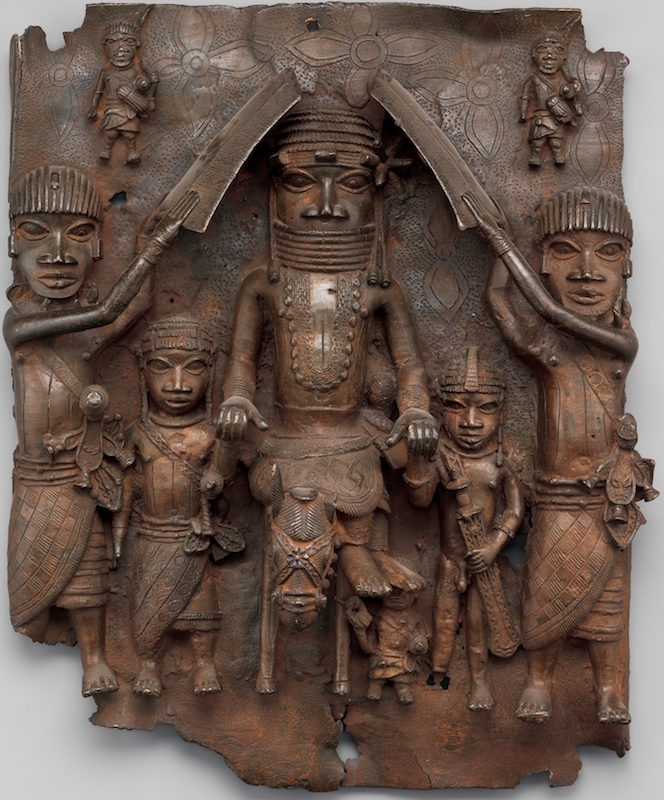 The rich artistic traditions of the Yoruba continue to thrive in the present day. The neighboring kingdom of Benin, which traces its origins to Ife, established its present dynasty in the fourteenth century. Over the next 500 years, specialist artisans working for the Benin king created several thousand works, mostly made of luxury materials such as ivory and brass, that offer insights into life at the royal court (image below). Other state societies emerged in the eastern and southern parts of the continent. The Aksum empire (also known as Axum), one of the earliest Christian states in Africa, flourished from the first century C.E. into the eleventh century, producing remarkable stone palaces and enormous granite funerary monoliths. 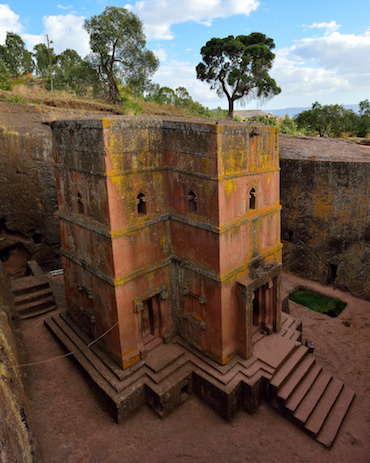 Christian faith inspired the artistic creations of later dynasties, including the extraordinary churches of Lalibela hewn from solid rock in the thirteenth century, and the illuminated manuscripts and other liturgical arts of the later Solomonic era. Notable among the kingdoms that emerged in southern Africa is Mapungubwe in present-day Zimbabwe, a stratified society that arose in the eleventh century and grew wealthy through trade with Muslim merchants along the eastern African coast. 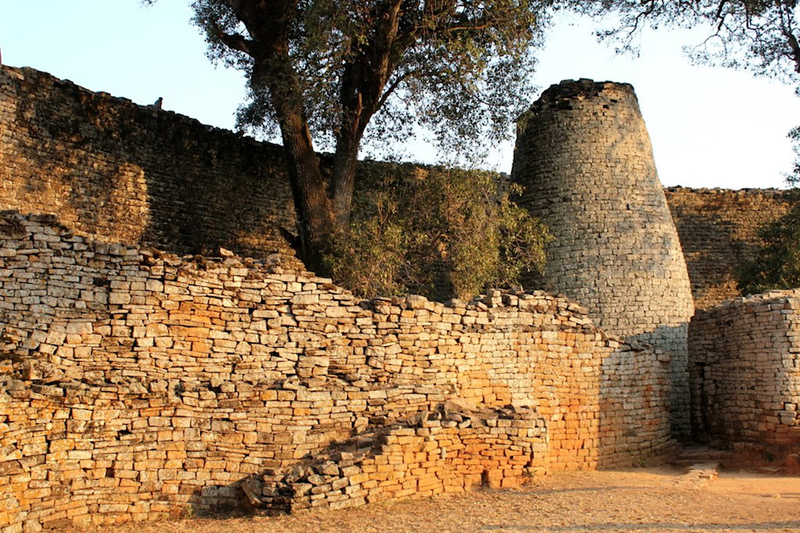 Just to the north are the remains of an ancient city known as Great Zimbabwe, considered one of the oldest and largest architectural structures in sub-Saharan Africa. This massive complex of stone buildings, spread over 1,800 acres, was constructed over 300 years beginning in the eleventh century. In the fifteenth century, the age of exploration ushered in a period of sustained engagement between Europe and Africa. The Portuguese, and later the Dutch and English, began trade with cities along the western coast of Africa around 1450. 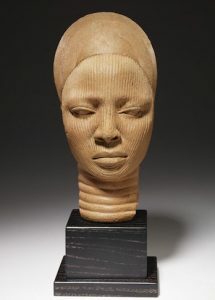 They returned from Africa with favorable accounts of powerful kingdoms as well as examples of African artistry commissioned from local sculptors. These exquisitely carved ivory artifacts, now known as the “Afro-Portuguese” ivories, were brought back from early visits to the continent and became part of the curiosity cabinets of the Renaissance nobles who sponsored exploration and trade. Through trade, African artists were also introduced to new materials, forms, and ideas. 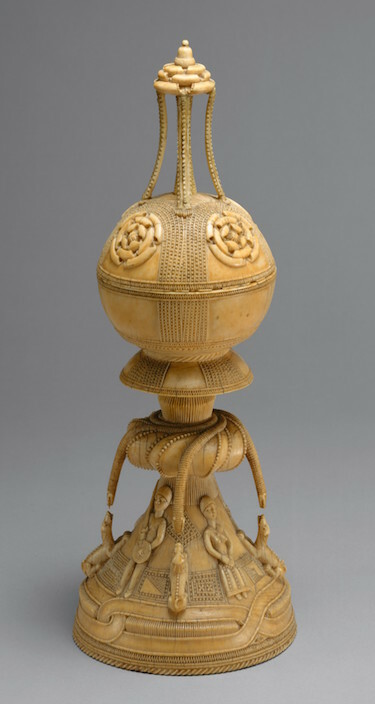 Although historically glass and shell beads were made indigenously, trade with Europe in the sixteenth century introduced large quantities of manufactured glass beads that became widely used throughout Africa (see a later example here). 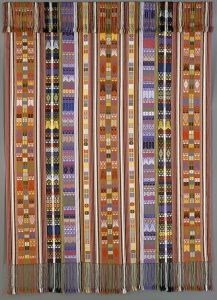 European imports of copper and coral made these luxury materials more plentiful, and artists used them in greater quantities (as in the Head of an Oba, above). Artifacts of European manufacture, such as canes and chairs, served as prototypes for the development of new prestige items for regional leaders (as in the Linguist’s Staff, above). Along with goods imported from Europe, the travelers also brought with them their systems of belief, including Christianity. 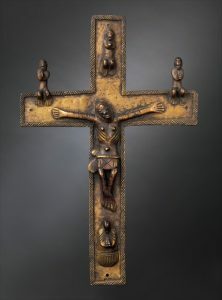 In some cases, such as in the central African kingdom of Kongo, Christianity was embraced and its iconography (refers to the traditional or conventional images or symbols associated with a subject, especially a religious or legendary subject) integrated into the artistic repertoire. 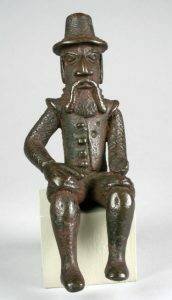 In other parts of Africa, the foreign traders themselves were sometimes represented in artworks. Western trade with Africa was not limited to material goods such as copper, cloth, and beads. By the sixteenth century, the transatlantic slave trade had already begun, forcibly bringing Africans to the newly discovered Americas. Slavery had existed in Africa (as it did elsewhere in the world) for centuries prior to the sixteenth, and many socially stratified African societies kept slaves for domestic work. The sheer number of slaves traded across the Atlantic, however, was unprecedented, as over 11 million Africans were brought to the Americas and the Caribbean over a period of four centuries. Driven by commercial interests, the slave trade peaked in the eighteenth century with the expansion of American plantation production, and continued until the mid-nineteenth century. While Europeans primarily profited from the slave trade, certain West African kingdoms, like Dahomey, also grew wealthy and powerful by selling captives of war. By the late eighteenth century, the slave trade began to wane as the abolitionist movement grew. Those who survived the forced migration and the notorious Middle Passage brought their beliefs and cultural practices to the New World. 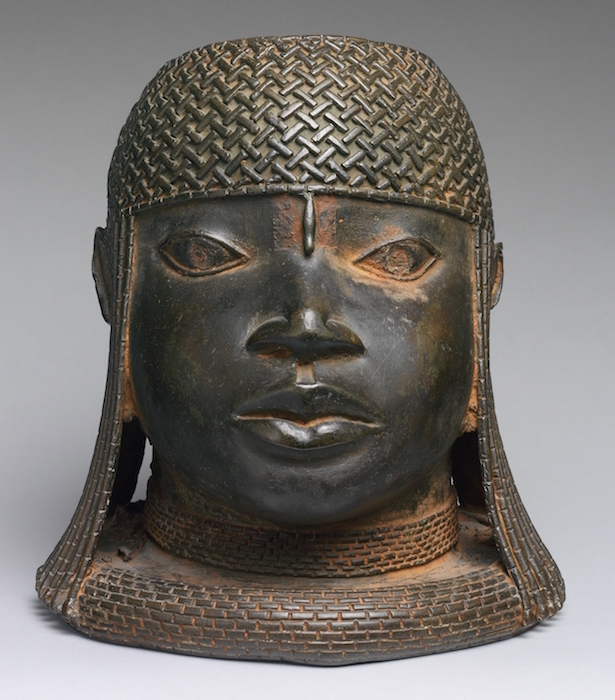 Within this far-flung diaspora, certain cultures—such as the Yoruba and Igbo of today’s Nigeria, and the Kongo from present-day Democratic Republic of Congo—were especially well represented. African slaves brought few, if any, personal items with them, although recent archaeological investigations have yielded early African artifacts, like the beads and shells found at the African burial grounds in New York’s lower Manhattan, which date to the seventeenth and eighteenth centuries. The influence of Africans in the Americas is perhaps best seen in diverse forms of cultural expression that have enriched our society tremendously. Architectural elements such as open-front porches and sloped hip-roofs reflect African influence in the Americas. The religious practices of Haitian Vodou have roots in the spiritual beliefs of Dahomean, Yoruba, and Kongo peoples. Some elements of cuisine in the American South, such as gumbo and jambalaya, derive from African food traditions. Certain musical forms, such as jazz and the blues, reflect the convergence of African musical practices and European-based traditions. Although the slave trade was banned entirely by the late nineteenth century, European involvement in Africa did not end. Instead, the desire for greater control over Africa’s resources resulted in the colonization of the majority of the continent by seven European countries. The Berlin Conference of 1884–85, attended by representatives of fourteen different European powers, resulted in the regulation of European colonization and trade in Africa. Over the next twenty years, the continent was occupied by France, Belgium, Germany, Britain, Spain, Italy, and Portugal. By 1914, the entire continent, with the exception of Ethiopia and Liberia, was colonized by European nations. The colonial period in Africa brought radical changes, disrupting local political institutions, patterns of trade, and religious and social beliefs. The colonial era also impacted cultural practices in Africa, as artists responded to new forms of patronage and the introduction of new technologies as well as to their changing social and political situations. 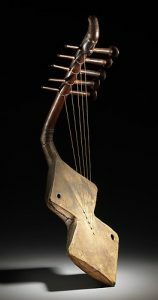 In some cases, European patronage of local artists resulted in stylistic change (for example the harp, left) or new forms of expression. At the same time, many artistic traditions were characterized as “primitive” by Westerners and discouraged or even banned. Although African artifacts were brought to Europe as early as the sixteenth century, it was during the colonial period that such works entered Western collections in significant quantities, forming the basis of many museum collections today. 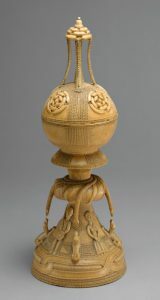 African artifacts were collected as personal souvenirs or ethnographic specimens by military officers, colonial administrators, missionaries, scientists, merchants, and other visitors to the continent. In many of these instances of collecting, objects were gathered through voluntary trade. In one extreme instance, an act of war initiated by Britain against one of its colonies, thousands of royal art objects were removed from the kingdom of Benin following its defeat by a British military expedition in 1897 (image below). 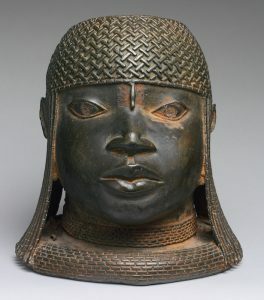 European nations with colonies in Africa established ethnographic museums with extensive collections, such as the Royal Museum for Central Africa in Tervuren, Belgium, the Völkerkunde museums in Germany, the British Museum in London, and the Musée de l’Homme in Paris (now housed at the Musée du Quai Branly). In the United States, which had no colonial ties to Africa, the nascent study of ethnography motivated the formation of collections at the American Museum of Natural History in New York and the Field Museum in Chicago. In 1923, the Brooklyn Museum became the first American museum to present African works as art. Independence movements in Africa began with the liberation of Ghana in 1957 and ended with the dismantling of apartheid in South Africa during the 1990s. The postcolonial period has been challenging, as many countries struggle to regain stability in the aftermath of colonialism. Yet while the media often focuses on political instability, civil unrest, and economic and health crises, these represent only part of the story of Africa today. From its many urban centers to more tradition-based rural villages, Africa is increasingly entering the global marketplace. The proliferation of systems of communication, such as computers and cell phones, throughout Africa has facilitated increased interaction with other parts of the world. As Africa moves into the twenty-first century, hope lies in its natural and human resources and the commitment of many Africans to work toward a stable and prosperous future. In spite of Africa’s political, economic, and environmental challenges, the postcolonial period has been a time of tremendous vigor in the realm of artistic production. Many tradition-based artistic practices continue to thrive or have been revitalized. In Guinea, the revival of D’mba performances in the 1990s, after decades of censorship by the Marxist government, is one example of cultural reinvention. 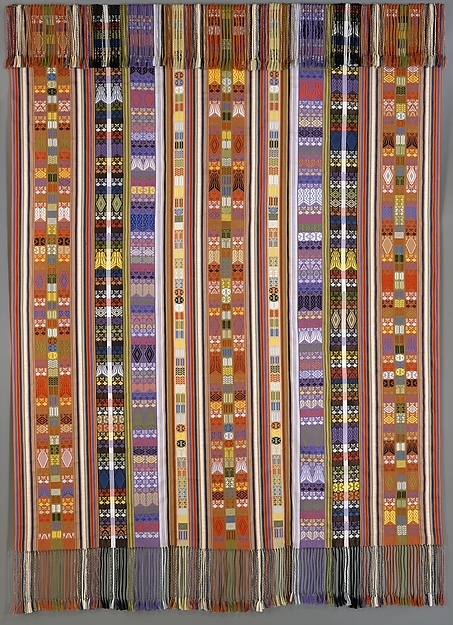 Similarly, in recent years, Merina weavers in the highlands of Madagascar have begun to create brilliantly hued silk cloth known as akotofahana, a textile tradition abandoned a century ago. Photography, introduced on the continent in the late nineteenth century, has become a popular medium, particularly in urban areas. Artists like Seydou Keïta, who operated a portrait studio in Bamako, Mali, in the colonial period, set the stage for later generations of photographers who captured the faces of newly independent African countries. 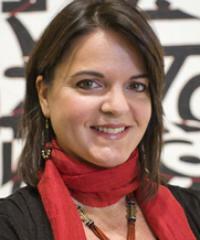 It is also important to mention developments in modern and contemporary African art. During the colonial period, art schools were established that provided training, often based on Western models, to local artists. Many schools were initiated by Europeans, such as the Congolese Académie des Arts, established by Pierre Romain-Desfossé in 1944 in Elisabethville, whose program was based on those of art schools in Europe. Less frequently, the teaching of modern art was initiated by indigenous Africans, such as Chief Aina Onabolu, who is credited with introducing modern art in Nigeria beginning in the 1920s. Since the mid-twentieth century, increasing numbers of African artists have engaged local traditions in new ways or embraced a national identity through their visual expression. Artists in today’s Africa are the products of diverse forms of artistic training, work in a variety of mediums, and engage local as well as global audiences with their work. In recent decades, contemporary artists from Africa, both self-taught and academically trained, have begun to receive international recognition. Many artists from Africa study, work, and/or live in Europe and the United States. Kenyan-born Magdalene Odundo, for example, was trained as an artist in schools in Kenya and in England, where she now lives. The burnished ceramic vessels she creates, which are purely artistic and not functional, embody her diverse sources, including traditional Nigerian and Kenyan vessels as well as Native American pottery traditions of New Mexico. The work of contemporary African artists like Odundo reveals the complex realities of artistic practice in today’s increasingly global society. This entry was posted in Africa, Art History, History. Bookmark the permalink.